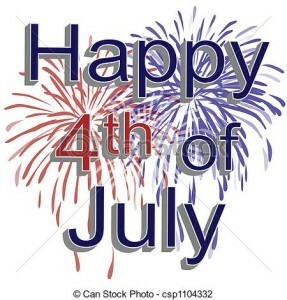 Wishing everyone a wonderful and safe 4th of July! Enjoy this special time with your family and friends and remember how truly blessed we are! What a strange title for a post, huh? I wanted to share for those that have not read my summer newsletter. 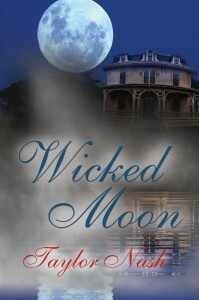 http://www.taylornash.com/newsletter/summer-2014-update/ I’m thrilled to show off the cover of Wicked Moon. I’d like to tell you a little about the cover. A very dear lady and talented photographer, Amy Davies, took this picture of the real mansion in Manomet, Massachusetts, the backdrop for Wicked Moon. Not only does it depict the beautiful house and its setting, but she worked her magic inserting the full “wicked moon”. Want a little clue as to what the title represents? Envision this house sitting on Cape Cod Bay, full moon, and a young ghost, Belinda, paces the widow’s walk waiting for her true love to come back from the sea. Read the coming soon section at taylornash.com and view pictures of the house before and after outside restoration. Profits from Wicked Moon will go back to the Simes Foundation. I’ll blog more about how I got involved in this incredible journey in upcoming blogs. Now for the cucumbers! I LOVE cucumbers! This year I’ve planted in container pots 2 cucumbers, 1 green pepper, and 3 cherry tomatoes. If the blooms are any indication, I should have an incredible fruit bearing season. This recipe caught my eye and for those cucumber lovers out there, thought I’d share with you. It’s a simple sweet and sour pickle recipe without cooking that lasts 2-3 months in the refrigerator. Place sliced cucumbers and onions in a large container or bowl. In a separate bowl, stir vinegar, sugar, water and salt together until dissolved. Add celery seed. Pour mixture over the cucumber and onions and refrigerate in a jar. Keep adding freshly cut cucumbers as they ripen on the vine. Hope you have a great week and enjoy your blessings! I promised I would not complain this summer when it got hot, but yesterday it was pretty warm on the golf course. Thank goodness for a good breeze while we enjoyed a day of camaraderie at our 18-holers guest day. 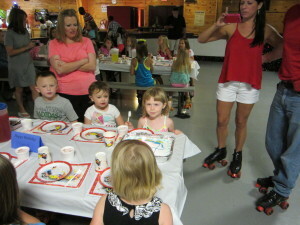 I finally downloaded pictures of Olivia’s (my youngest granddaughter) 4th birthday party at Skateland. I donned on skates and tried to keep up with Marissa, my 6 year-old granddaughter. My goal was not to fall which I succeeded, but I have to admit my legs were pretty sore the next day. Priceless memories for this grandma and great grandma. Got a great recipe I wanted to share this week. Since it’s too hot to fire up the oven when you’ve got a sweet tooth craving – try this really cool recipe. You blend a box of angel food cake mix with a box of your favorite cake mix – any flavor you want. Blend the two dry mixes together well. Whenever you have a craving for something sweet, with basically zero calories, put in a mug or small bowl 3 tablespoons of the dry mixture, 2 tablespoons of water, and blend well. Cook in the microwave for 1 minute. Let it stand for 15 minutes. I love to mix it with cool whip, a little honey, and fresh fruit that’s in season. It’s wicked awesome with fresh strawberries my neighbors gave me. It’s also a great recipe to let kids make as it doesn’t involve an oven or heat! Stay cool, have fun, and remember how blessed we are each day! It was an incredibly long and brutal winter in Illinois, but summer has finally arrived. The only good thing about winter was it allowed me to get the draft of Wicked Moon completed. It’s now in the hands of my editor. I’m shooting for an October 2014 release date. I’ve played a few rounds of golf and recently came back from a trip to Branson, MO with seven girlfriends. The courses down there were awesome, but challenging with lots of blind shots and changes in terrain. Wonderful group of girlfriends and lots of memories were made. My goal is to blog once a week, so stay tuned for updates on Wicked Moon, recipes I’ve been experimenting with, and maybe some fun contests!! Enjoy my friends! 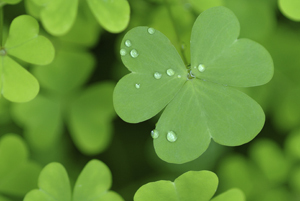 I love this Irish Blessing…I don’t know who the author is, but I am so wishing this to everyone today!